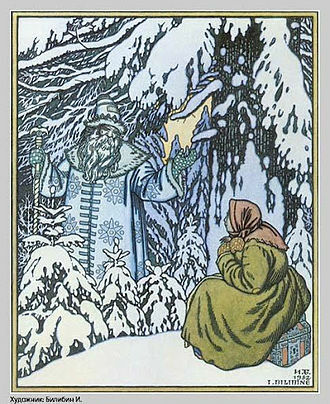 Today is occasionally called King Frost Day in honor of the famous Frost Fair held in London in 1814. 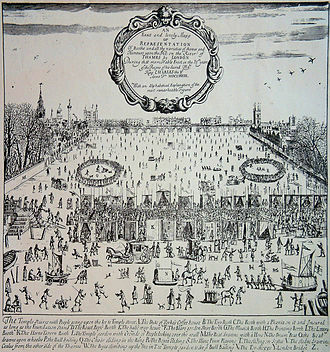 River Thames frost fairs were held on the tideway of the River Thames in London in a few winters between the 17th century and early 19th century, during the period known as the Little Ice Age, when the river froze over. During that time the British winter was more severe than now, and the river was wider and slower, and impeded by Old London Bridge. Even at its peak, in the mid-17th century, the Thames freezing at London was less frequent than modern legend sometimes suggests, never exceeding about one year in ten except for four winters between 1649 and 1666. From 1400 to the removal of the medieval London Bridge in 1835, there were 24 winters in which the Thames was recorded to have frozen over in London. 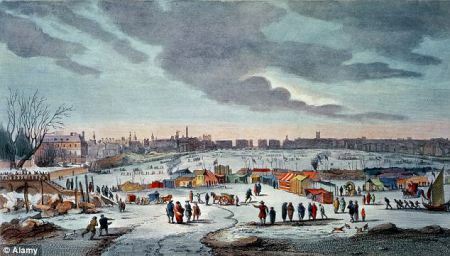 Frost fairs were far more common elsewhere in Europe, for example in the Netherlands on frozen canals. The Thames freezes over more often upstream, beyond the reach of the tide, especially above the weirs, of which Teddington Lock is the lowest. The last great freeze of the higher Thames was in 1962-63. During the Great Frost of 1683–84, the worst frost recorded in England, the Thames was completely frozen for two months, with the ice reaching a thickness of 11 inches (28 cm) in London. Solid ice was reported extending for miles off the coasts of the southern North Sea (England, France and the Low Countries), causing severe problems for shipping and preventing the use of many harbors. Near Manchester, the ground was frozen to 27 inches; in Somerset, to more than four feet. The Thames had frozen over several times in the 16th century — King Henry VIII traveled from central London to Greenwich by sleigh along the river in 1536. Queen Elizabeth I took to the ice frequently during 1564, to “shoot at marks”, and small boys played football on the ice. 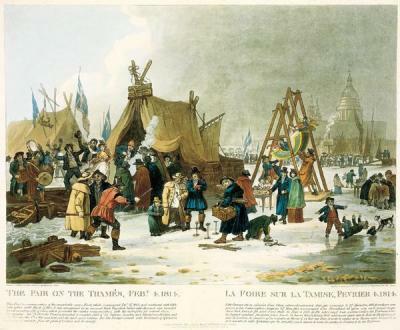 The frost fair of 1814 began on 1 February, and lasted four days. An elephant was led across the river below Blackfriars Bridge. A printer named George Davis published a 124-page book, Frostiana; or a History of the River Thames in a Frozen State. The entire book was type-set and printed in Davis’ printing stall, which had been set up on the frozen Thames. This was the last frost fair. The climate was growing milder; old London Bridge was demolished in 1835 and replaced with a new bridge with wider arches, allowing the tide to flow more freely; and the river was embanked in stages during the 19th century, all of which made the river less likely to freeze. 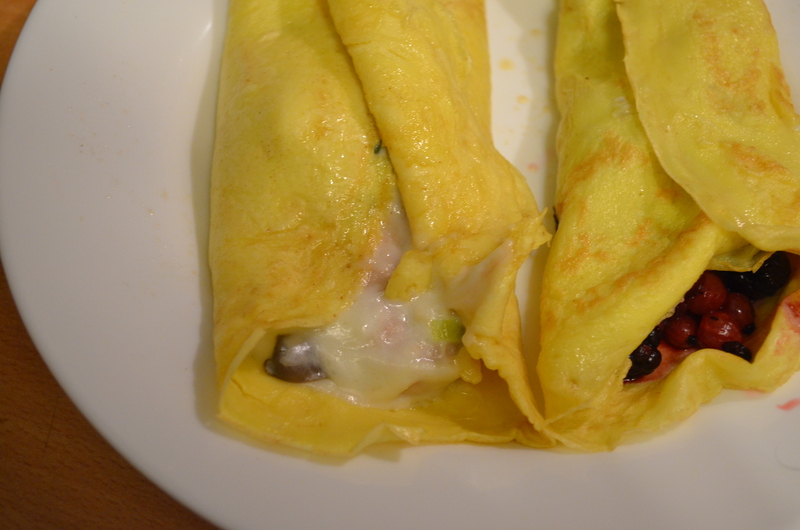 Pancakes are very versatile for both savory and sweet dishes. Use your imagination to make fillings for them. 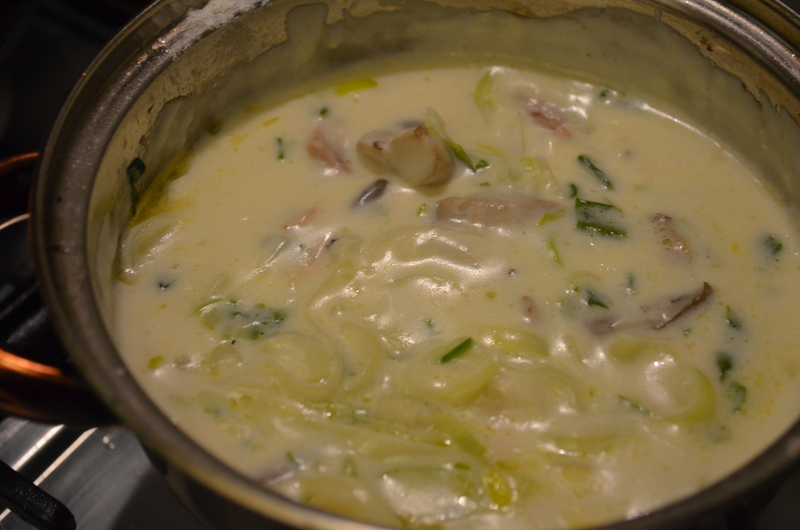 Here’s a version I made today using creamed chicken, fresh oyster mushrooms, and leeks. Poach a whole chicken in broth. Remove it and strip the meat. 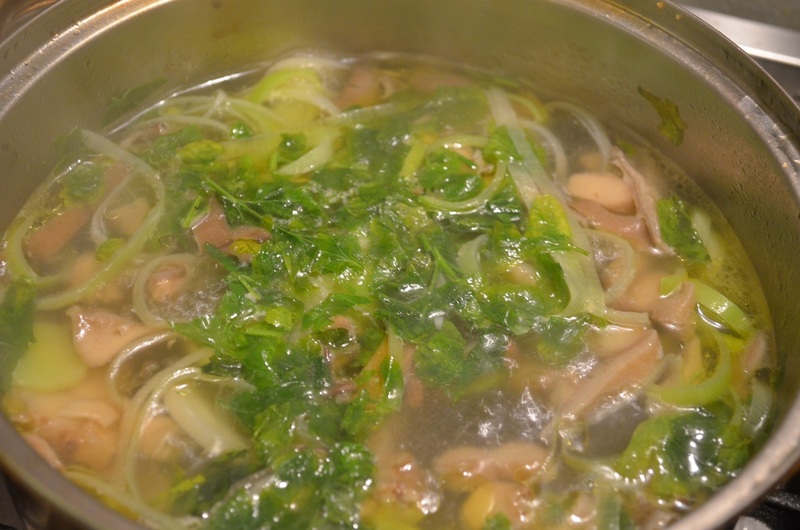 Meanwhile poach sliced leeks and mushrooms in the broth. 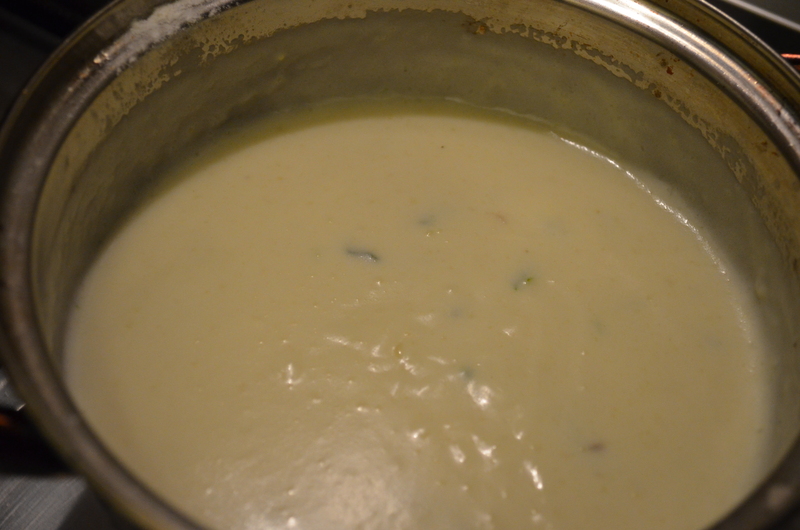 Make a cream sauce by first making a roux of flour and butter, then adding a mix of the broth and heavy cream. Add the chicken and vegetables, and warm through. 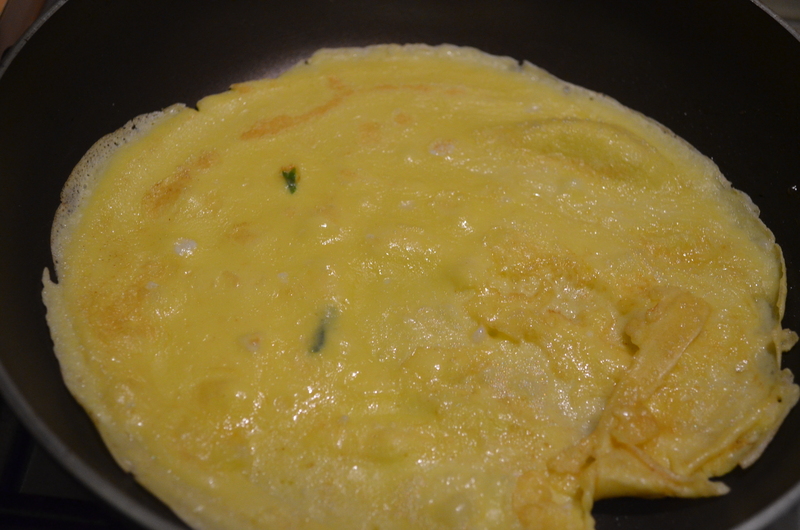 Make the pancakes one at a time by heating butter in your pan, then adding a ladle full of batter. Swirl it around to coat the bottom of the pan. When the top is dry flip it over and cook the other side. Turn on to a plate and keep warm whilst you make more. 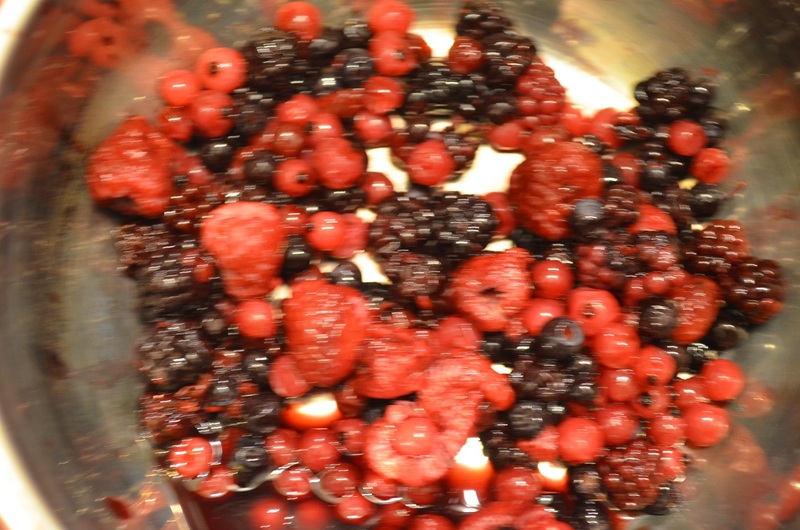 For dessert today I made a filling of poached wild berries in a sauce of sugar and butter. When your fillings and pancakes are all ready, lay one pancake at a time on a plate, spoon in some filling, and roll it up.